The capacities of slender concrete block walls under sustained eccentric axial loads were investigated using the finite element method. The finite element model accounts for the inelastic material responses, P-o effects, and time dependent (creep) strains. Creep functions developed from test data for normal weight masonry prisms were used in the numerical model. Loading and geometric parameters are included in the study. Sustained loads in the range of service loads were kept constant for a period of 25 years after which a short term loading was applied to the walls to investigate the residual wall capacities. 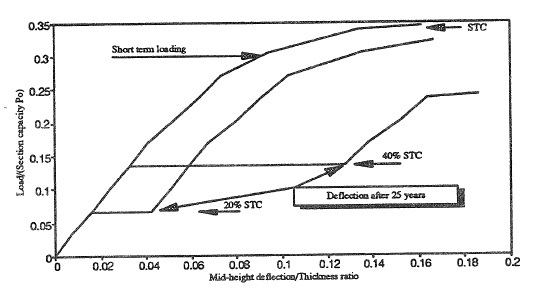 Considerable reductions in the short term capacities was found as a result of the long duration of the load.